By J. Hudson & Co. Birmingham. 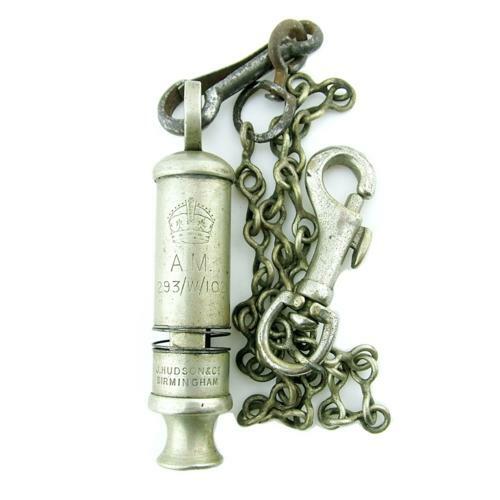 The less commonly found 'tube' whistle used by wartime aircrews. Period photos show these hanging from the 1941 pattern Mae West or aircrew blouse. Manufactured in chromed brass. Air Ministry King's crown markings and reference numbers '293/W/102'. Good clear marks. Light tarnishing but in very good '+' used condition. Has added wire 'rings' (unknown reason) and a chain lanyard. Guaranteed original and not one of the may copies now on the market. Stock code MW17651.